Well if you have never done it ….. this is the chance! 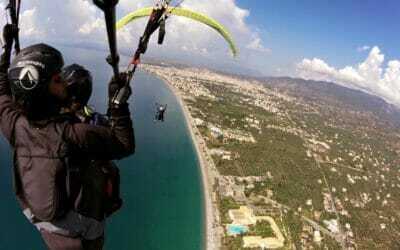 It’s probably one of the best sites for a paragliding flight in the world. This combination of an high mountain and a wonderful sea bay is unique. 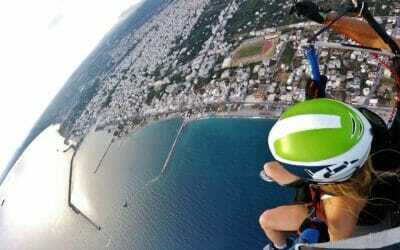 People who have experienced paragliding here – even the most skeptical ones – always come back for more. The funny thing is they state it’s a rather relaxing experience, it’s like in a nice dream when you dream that you’re flying …. only its for real. The guys running this business who will take you up the mountain and fly you down to the beach are also unique. They are real professionals and they make you feel very sure about the whole endeavor. So if you belong to the rather skeptical species who thinks such things are only for the very daring, take your chance with them …. you will thank us for suggesting this later.